After it emerged from the Communist blackout during the 1970s, China prospered by building export industries, largely powered by coal. In earlier times, China was only a modest consumer of energy. Recent governments promoted heavy industry–including metals and other mineral products–exploiting the country’s largest energy resource. Each year since 2010, China consumed more coal than all the rest of the world. Communist emperor Hu Jintao (2003-2013) built coal-fired electricity plants, blast furnaces, smelters, cement kilns and pottery ovens, never seeming to look back. His regime turned China into the world’s Coal Empire and sent its capital into a new Dark Age. Beijing, along with much of northeast China, has been suffering from massive air pollution–comparable to Pittsburgh at its worst in the 1940s. As angry protests grew, successor Xi Jinping feared losing the Mandate of Heaven and started to tamp down some of the coal burning. Four years later, northeast China showed little air-quality improvement. 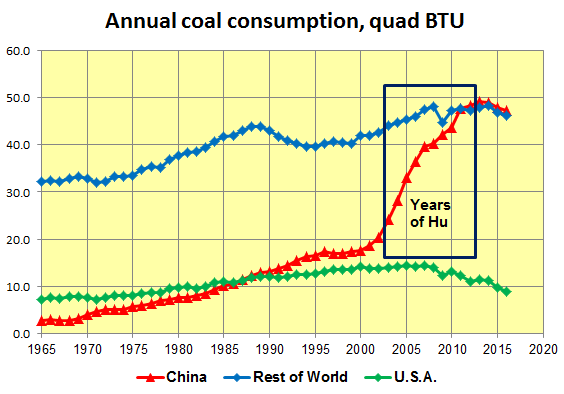 That is hardly surprising, since Chinese coal consumption, after growing by a factor of about 2-1/2 over the ten years of Communist emperor Hu, shrank only about two percent during the first four years of Xi. Propaganda: Government media in China often tout national progress in renewable energy: a government subsidized solar-panel industry and the growth of wind farms. However, modest growth in solar and wind energy has been swamped by surging outputs from coal-fired power plants. Recently the independent TMT Post (Telecommunications, Media and Technology, based in Beijing) reported in Chinese about plans to replace conventionally fueled cars with electric vehicles, citing a speech by Xin Guobin, China’s Vice Minister of Industry. As electricity is actually generated in China, using it to power vehicles becomes more of an environmental threat than burning gasoline. For the same amount of mechanical energy, both the toxic and the greenhouse gas emissions are higher. A few years ago, some Chinese engineers spoke hopefully about cleaner and more efficient generating plants, but high costs made them a small element in the power industry. Recently, air pollution–darkening the skies–was reported as causing up to 35-percent losses at Chinese solar farms. Death by air: China’s air pollution from coal is causing more than a quarter million premature deaths a year, as reported in the New York Times. Economist Michael Greenstone of the University of Chicago and four other academics recently found that in the northeast provinces of Shanxi and Hebei air pollution from burning coal has shortened life expectancy by three years. So far the Xi regime failed to make a significant difference. After enforcing some restrictions on coal for a couple of years, reports of lower economic growth led to retrenchment. Initiatives to switch from coal to natural gas made minimal progress, because China lacks gas reserves and infrastructure to transport gas. In rural areas, many Chinese are reported to defy regulations and burn coal and waste wood for home heating. China’s choices are economic. There is no practical way to reconcile headlong growth fueled by coal with good air quality and normal life expectancy. It will be one or the other. If air quality gets substantial improvement–no matter what combination of strategies might be employed–the Chinese economy will slow down in order to pay for it. This entry was posted in Business, Environment, History on January 8, 2018 by Craig Bolon. “Falmouth selectmen decided…not to appeal a judge’s determination that [two wind turbines] must be shut down.” As noted by the Boston Globe in 2017, they were “simply built too close to homes.” Not mentioned in the Globe: potential harms to residents’ health had been clear years before when the turbines were proposed, yet the project had been promoted by a prominent state official during the Patrick administration. Former Gov. Patrick’s first-term energy agenda was also bollixed by a wholly avoidable fracas over burning wood for energy–a gross source of ordinary, fine-particle air pollution. At the start of a second term, Patrick insisted that all “cabinet officers” resign. He then reappointed each one except for the former energy secretary, and he soon restructured policy, moving away from wind energy and toward solar energy. Political struggles over Cape Wind were often waged by proxy. During 2003, for instance, Michael Egan of Osterville and other opponents funded a review by a nominally nonprofit organization, claiming the project would cost the region more than $60 million a year in lost revenue because of fewer tourists and lower real estate values. During those years, Cape Wind’s chief developer Jim Gordon was constantly on the defensive and would not say much about financial issues. In November, 2010, the Patrick administration set a price, approving a power-purchase agreement between Cape Wind and National Grid–the largest utility in southeastern Massachusetts–starting at $0.187 per kWh. For the year 2010, ISO New England reported an average wholesale price for electricity distributed in New England of $0.0593 per kWh. Cape Wind came to market at more than three times New England’s average price. The high price shifted opinions away from Cape Wind. Many felt Cape Wind had lied to the public about the feasibility of its plans. Under 2010 contracts with utilities, Cape Wind got until the end of 2014 to start construction. Opponents tried to hinder Cape Wind with lawsuits. They prevailed; Cape Wind never installed a wind turbine. At the end of 2014, utilities terminated contracts with Cape Wind for lack of performance. That marked the end of a regional era in wind energy, coming at the end of the Patrick administration. The development of wind energy in New England is strongly skewed toward the northern states. Maine, New Hampshire and Vermont have about 90 percent of the rated generating capacity, with 68 percent just in Maine. Sources of data report amounts that differ, mostly because of dates when wind farms are considered active. Since taking office in 2011, Maine’s aggressive and racist Gov. LePage has missed few chances to oppose wind and solar energy development. His chief advisor has been an appliance installer with no scientific training. However, wind-energy business in Maine is also aggressive. After being stymied in 2013 and 2014, developers came back strongly the next two years, opening six wind farms and doubling Maine’s capacity. Because of term limits, LePage leaves office in January, 2019. Since 2012, the remainder of New England has seen little wind-energy activity, adding less than 20 MW of rated capacity on land. While it was clear that former Gov. Patrick in Massachusetts and former Gov. Shumlin in Vermont stepped aside in the face of political forces, the situation in New Hampshire remains murky. Geographies of Connecticut and Rhode Island offer little land-based wind potential, although there is substantial potential over Long Island Sound and nearby ocean. 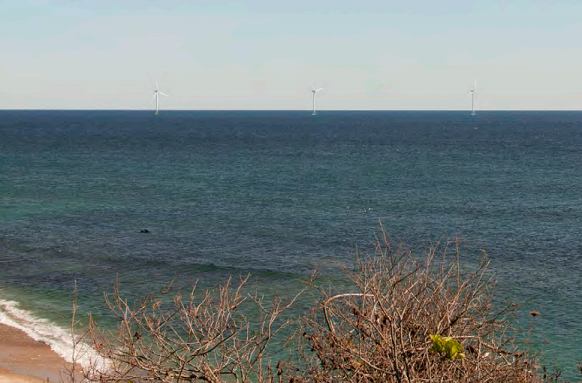 In the spring of 2017, the Deepwater Wind company reached full power with a 5-turbine offshore wind farm, rated at 30 MW, located just south of Block Island–part of Rhode Island southwest of Narragansett Bay. The starting wholesale price of energy is very high: $0.244 per kWh. However, Block Island was never connected to the New England grid before and was paying even higher prices to a company operating a small plant using diesel engines. There are no similar offshore opportunities of comparable size elsewhere in New England. However, Martha’s Vineyard and–ironically–Nantucket both suffer from frequent problems. They receive electricity from the New England grid, but demands often exceed supply. When that happens, voltages sag and can drift out of phase with currents. This entry was posted in Business, Development, Environment, History, Projects, Regulations on January 2, 2018 by Craig Bolon.